Is Bread Bad for Birds? Some Can Be Good! Is There Any Good Bread for Birds? Many young birders first get interested in birds while they feed bread to ducks at a local pond, but experienced birders know that bread is not a suitable food to offer birds. Or is it? With care and caution, there is good bread you can feed birds. Most typical sliced bread or sandwich bread is a poor food choice for birds. This bread is heavily processed and contains chemicals and preservatives that are not suitable for wild birds. Bread contains very little protein, which birds need to develop muscles and feathers, and it does not contain the fat birds need for energy. Instead, bread is primarily a carbohydrate that, while it will fill a bird's stomach and alleviate hunger, does not provide much nutrition. The same is true for similar bread-like products such as buns, bagels, crackers, chips, pretzels, cookies, cereal, and donuts. When eaten excessively, bread will cause health problems for birds, including malnutrition and obesity. This is particularly prominent among young waterfowl in urban and suburban areas where ducklings and goslings may be fed tremendous amounts of bread. As these young birds fail to get the proper nutrients for healthy growth, they can develop deformed wings and legs, aggressive temperaments, poor circulation, and many other difficulties. What Makes Bread Good for Birds? When choosing what ingredients to use to create a good sandwich to feed birds, it is important to consider which birds you will be feeding. If jays, woodpeckers, and nuthatches are frequent guests at your feeders, opt for a sandwich with peanut butter and nuts. On the other hand, if orioles and warblers are the hungriest visitors, a sandwich with grape jelly and orange slices will be most popular. In addition to these items, other kitchen scraps that are suitable for birds could be included in unusual sandwich creations. Under no circumstances should some common human sandwich items be offered to birds. Processed lunch meat, sugar-free or low sugar spreads, soft cheeses, and bacon may make great sandwiches for humans, but none of these items are great for birds. They contain greater quantities of salt and other chemicals that can be even more unhealthy or outright dangerous for birds, even if only offered very rarely. Similarly, no items that are overly stale, moldy, or spoiled should ever be fed to birds. Above all, bread should never be offered regularly to birds. Just as candy is not suitable for a large part of a human's diet, bread is "candy" to birds and should be only a rare treat rather than a regular meal, even when it has been enhanced with healthier spreads and toppings. 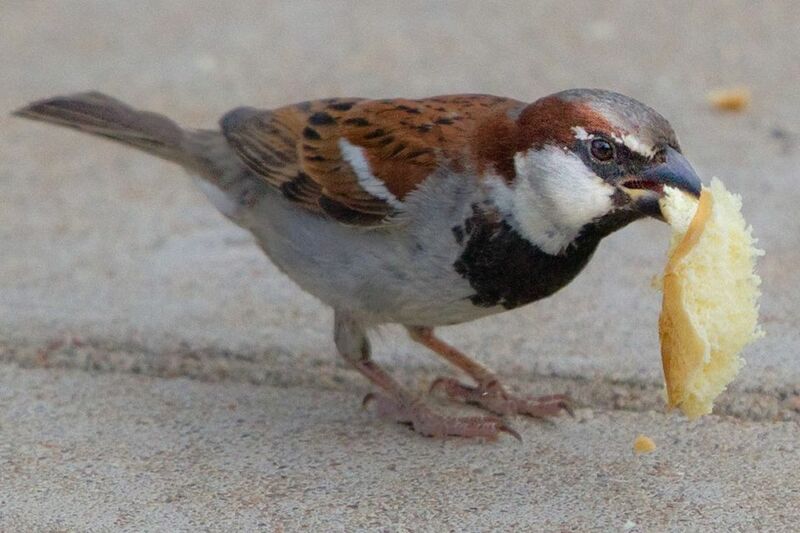 Ideally, bread scraps should be even more restricted in spring and early summer when parent birds are feeding their nestlings. Similarly, in winter, offering a lot of bread will not give birds the best nutrition to survive harsh storms and cold temperatures. The best time to feed birds bread, though still only once in awhile, is at the height of summer after young birds have fledged and there are many birds visiting feeders and taking advantage of abundant natural, nutritional food sources. At that time, offering a few bites of bread will be less harmful to the birds that take advantage of it. Feeding birds bread is not the healthiest option, but when the bread has healthier ingredients for a bird-friendly sandwich, it can be a fun, rare treat to add to your backyard buffet.